← Don’t mess with water. 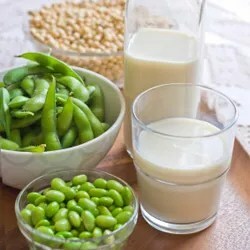 I covered Soy milk on the 6th March in a blog titled ” Soy vs Milk- which is better?” Here is some more interesting facts about soymilk. Can substitute for cow’s milk in many culinary applications. Does not contain milk protein (casein), which can increase mucus production and irritate the immune system in some people. Does not contain milk sugar (lactose), which can cause digestive distress in those who are lactose intolerant. Is a good source of protein – one cup contains four to 10 grams of soy protein. Fortified with calcium – while soymilk is naturally a good source of calcium, it doesn’t have as much as cow’s milk. Organic – many soy crops are heavily treated with pesticides. Free of the thickening agent carrageenan, a seaweed derivative, which I believe may be harmful, especially to the intestinal tract. I recommend one to two one-cup servings daily. Posted on April 17, 2013, in Uncategorized. Bookmark the permalink. Leave a comment.